Anyone that has flown United Airlines has probably picked up a United Hemispheres magazine. It’s a fantastic travel magazine with many inspiring travel columns, like ‘Three Perfect Days’ for example. This column walks the reader through three perfect days in an exotic city, whichever city is being featured that month. 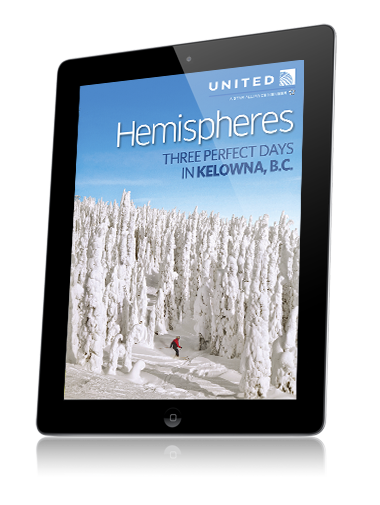 Expanding their content to reach a digital and mobile audience, United Hemispheres is now creating iPad apps, and the emagazine is available for free in the iTunes app store. The March issue of Hemispheres is created with mag+ version 4.1. Not only does this iPad app include stunning and inspirational content, it also includes some killer features that came out in the mag+ 4.1 release. Once you download this issue of Hemispheres, you will notice that the scrubber has been removed – giving the magazine a different feel. The letter from the CEO includes beautifully designed scrolling A-layer and the snapping feature, which snaps the B-layer into place as you scroll through text on the A-layer. The issue includes several in app auto-play videos that make you want to walk out of your office and go on vacation immediately! The Stay feature in the March issue is fantastic. As spectacular images auto scroll through the background, the user can read the A-layer copy that gives more detail on the location being featured, or simply tap to hide the text and enjoy the beautiful slide show. The Food and Drink section discusses California wines and takes advantage of the new mag+ pop-up features, providing a very smooth experience for the user. Hemispheres knows how to create iPad apps. This one is packed with interactive features. If you don’t already subscribe, you should. Download Hemispheres for the iPad here or the Android version here, in the Google Play store, and enjoy a wonderful escape, even when you’re not flying.